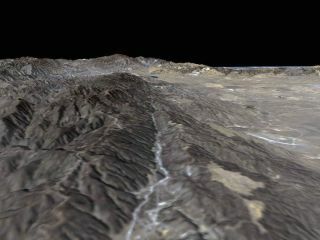 The space shuttle Endeavor captured this image of the San Andreas Fault on Feb. 11, 2000. The fault marks the slippery yet sticky boundary between two of Earth's tectonic plates, where the North America plate meets the Pacific plate. Earth is unique among the known planets: it has an abundance of water. Other worlds — including a few moons — have atmospheres, ice, and even oceans, but only Earth has the right combination to sustain life. Earth's oceans cover about 70 percent of the planet's surface with an average depth of 2.5 miles (4 kilometers). Fresh water exists in liquid form in lakes and rivers and as water vapor in the atmosphere, which causes much of Earth's weather. According to "Essentials of Geology" (7th Ed., Prentice Hall, 2000) by Frederick K. Lutgens and Edward J. Tarbuck, Earth's crust is made up of several elements: oxygen, 46.6 percent by weight; silicon, 27.7 percent; aluminum, 8.1 percent; iron, 5 percent; calcium, 3.6 percent; sodium, 2.8 percent, potassium, 2.6 percent, and magnesium, 2.1 percent. The crust is divided into huge plates that float on the mantle, the next layer. The plates are constantly in motion; they move at about the same rate as fingernails grow, according to NASA. Earthquakes occur when these plates grind against each other. Mountains form when the plates collide and deep trenches form when one plate slides under another plate. Plate tectonics is the theory explaining the motion of these plates. The mantle under the crust is about 1,800 miles deep (2,890 km). It is composed mostly of silicate rocks rich in magnesium and iron. Intense heat causes the rocks to rise. They then cool and sink back down to the core. This convection — with the consistency of caramel — is thought to be what causes the tectonic plates to move. When the mantle pushes through the crust, volcanoes erupt. At the center of the Earth is the core, which has two parts. The solid, inner core of iron has a radius of about 760 miles (about 1,220 km), according to NASA. It is surrounded by a liquid, outer core composed of a nickel-iron alloy. The outer core is about 1,355 miles (2,180 km) thick. The inner core spins at a different speed than the rest of the planet. This is thought to cause Earth's magnetic field. When charged particles from the solar wind collide with air molecules above Earth's magnetic poles, it causes the air molecules to glow, causing the auroras — the northern and southern lights. Earth has multiple layers: the crust, mantle and core. To better understand Earth's composition and history, geologists sometimes compare our planet to other rocky planets in our solar system. Venus is a similar size to Earth and a little bit closer to the sun, while Mars is only about half the size of Earth. Although several spacecraft have been sent to Venus and Mars, we know very little about their interiors — yet. The InSight mission is expected to launch in 2018 to do a deep drill into the surface of Mars and yield more information about the interior. Some planned rovers also carry lengthy drills, such as the ExoMars rover that launches in 2020. Venus has an extremely thick atmosphere that blocks visible light from reaching the surface, which means it requires radar to look at the surface. The surface appears fresh and young — no more than 500 million years old — due to the amount of volcanic activity on Venus' hellishly hot surface. While Venus likely has a crust, mantle and core similar to Earth, its magnetic field is very weak compared to Earth's. That may be because the core spins sluggishly to generate the magnetic field, or because there is no core at all. Mars is a cold planet whose atmosphere is not thick enough to let liquid water flow at the surface (although briny water is a possibility). It has a crust covered by dust; it's believed the crust is solid, with no plate tectonics. This allowed Mars to build up huge volcanoes on its surface, such as Olympus Mons. However, the Martian volcanoes appear dormant — why is still poorly understood. Underneath the surface, Mars likely has a mantle and a core; since Mars has no global magnetic field, the core probably does not spin.